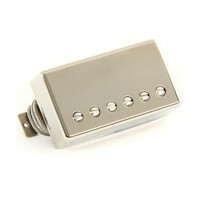 Gibson introduce the BurstBucker Pro humbucker pickup a nod to the history of outstanding Gibson tone. Inspired by the unmatched winding of pickups in years gone by the BurstBucker Pro channels the authentic vintage sound of historical pickups. An Alnico V magnet adds edge to the vintage tone whilst wax potting allows these pickups to resist microphonic feedback whilst being driven hard.